“Customers are dying for this product,” Roy Underhill said on Saturday during Highland Woodworking’s Fall Open House and Sale. 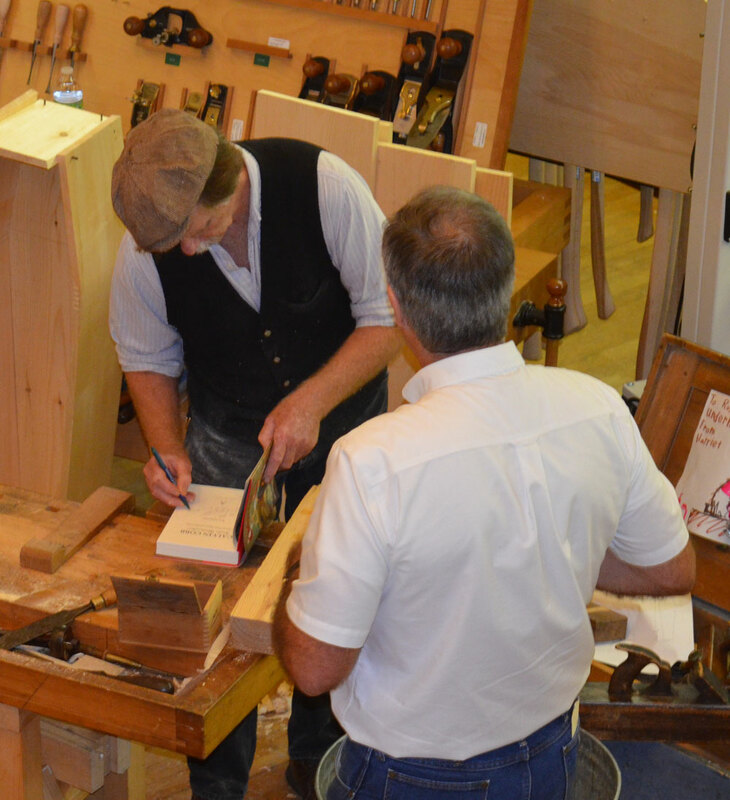 Just in time for Halloween, Roy spent the morning showing customers how to construct a coffin, throwing in puns while demonstrating how to make kerfs and how to steam and shape wood. Roy has been the host of The Woodwright’s Shop on PBS for over 35 years and knows how to mix craftsmanship with theater. “You have to be careful not to make a grave mistake, or it will come back to haunt you later,” Underhill said while emphasizing how to cut the proper angles and how to plane the edges. Fans from his show came and had his novel, Calvin Cobb: Radio Woodworker, autographed during the demo and even got in on the action with some sawing. Roy works exclusively with hand tools; the only “power tool” used for the demonstration was the tea-kettle needed to boil water. 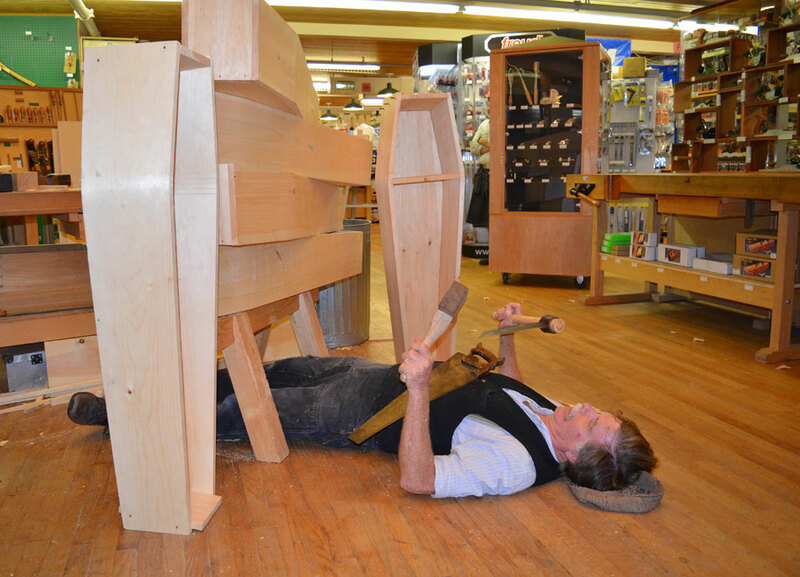 Grant Lutz, who was demonstrating green woodworking with a three-legged stool during the open house, also showed the power of working by hand. 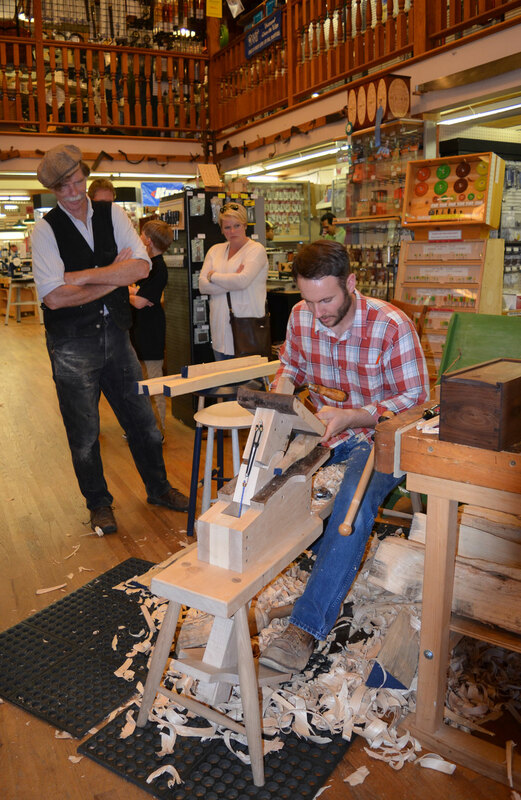 Lutz teaches at Highland and began the stool demonstration by first splitting a piece of wood and then slowly forming blanks for the legs. To do this, he had to carefully watch the grain of the wood and take it down one layer at a time. Lutz said he chose to demonstrate a stool because it is a good beginner project. “If you just want to learn how the tools work, a spoon is also a great place to start,” Lutz said. 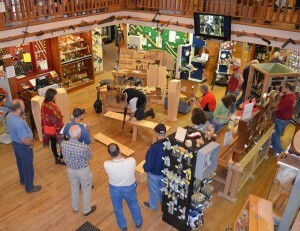 The morning also included demonstrations of Easy Wood Tools and the new SawStop JobSite Table Saw. Many people are familiar with the idea of the SawStop: it is supposed to halt immediately if it comes across a finger. While hearing this in theory is comforting, seeing it in practice is a different experience. To demonstrate the stopping device in action, Ben Arthur tested the SawStop with a hotdog, which is conductive like a finger. Immediately upon contact with the hotdog, the blade dropped down below the table out of harm’s way and the braking mechanism instantaneously stopped the blade’s rotation. This left the hotdog entirely unscathed. 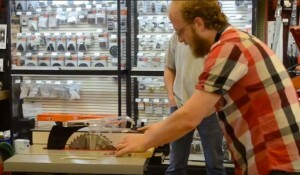 According to SawStop FAQ, “When the safety system activates, it will sometimes damage one or more teeth on the blade. Some users discard and replace the blade, while others choose to have their blades inspected/repaired by a qualified specialist.” So you can either discard the blade, like Ben usually does, or have it repaired. The brake cartridge into which the blade cuts when it drops can be plugged in for research by SawStop so they can look at the exact signal and moment when it was stopped. 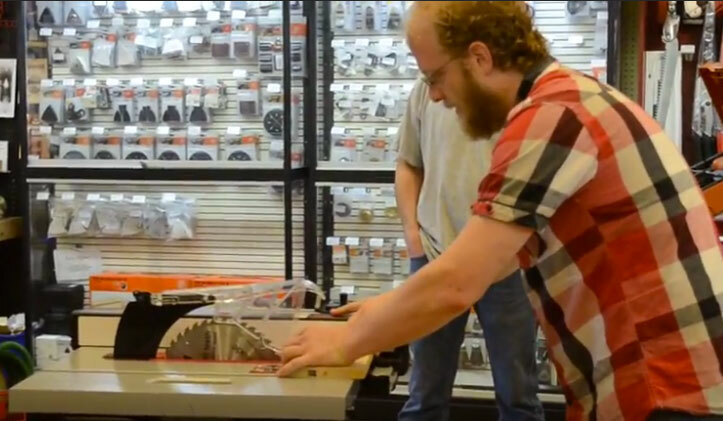 But, while the SawStop can save fingers, Roy joked during his demonstration that he uses the original brake on his hand tools: he stops moving his arms. CLICK HERE to see more photos from the Fall Highland Woodworking Open House with Roy Underhill.